Life is short, and Art long, opportunity fleeting, experience perilous, and decision difficult. I regret watching this three-day weekend draw to a close. Actually, it was like a four-day weekend, since my last day at school was an art museum field trip. 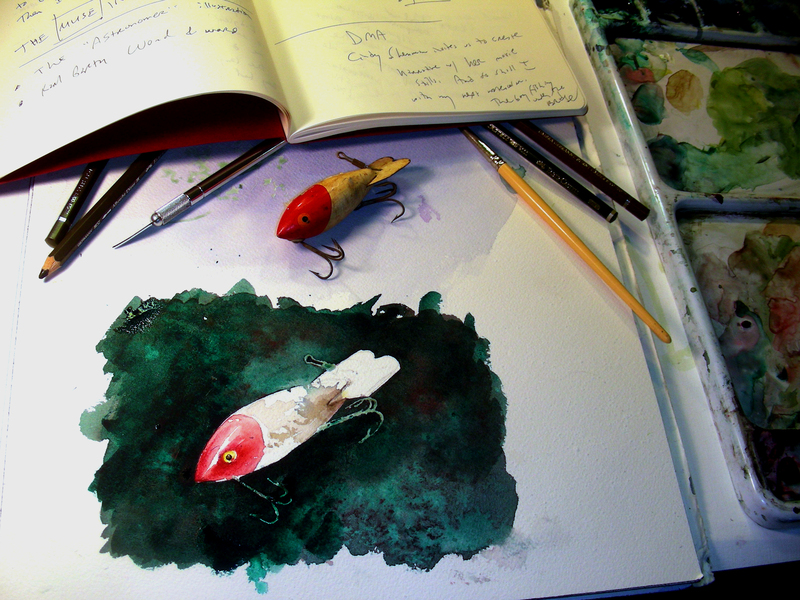 I should be ready to return, but I hate leaving the watercolors and studio work behind. I spread out my work from this weekend so I could sit back and look at it. 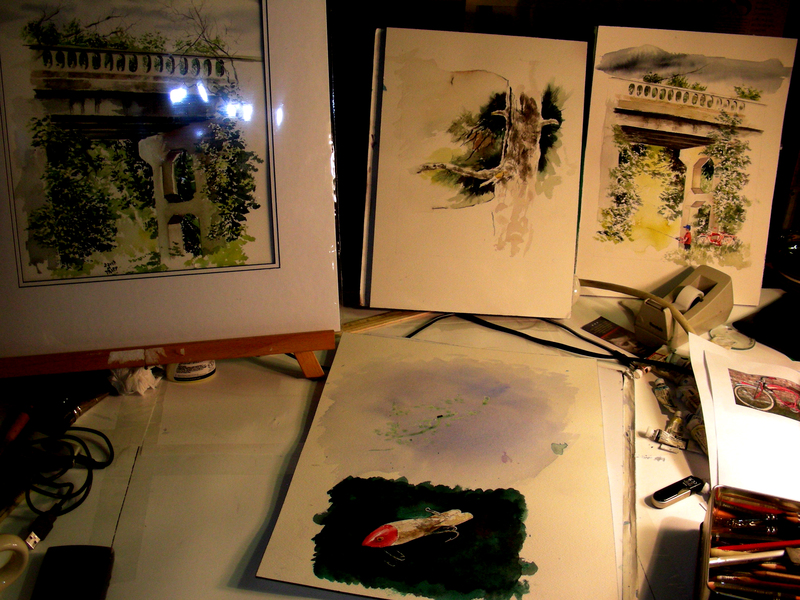 The work on the left is actually from a few years ago, done en plein air. Those of you following my blog know that the other three have been works in progress since Friday morning. Tomorrow after school I’ll put mats on them, encase them in plastic sleeves and put them in the box. 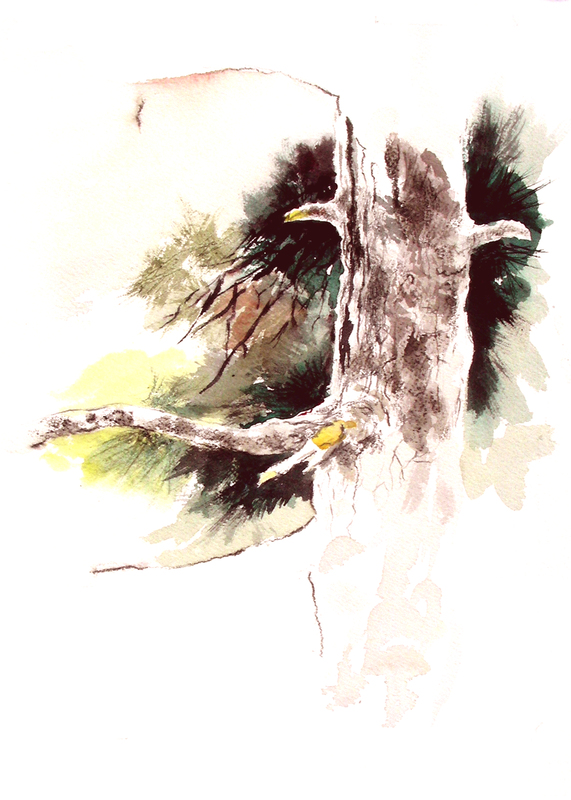 There are moments like now when I’m not really sure what direction to go with my watercolor subjects or techniques. These kinds of moments used to stall me. I really don’t want to go back to that. I figure that prolific is better than nothing at all. And long as I keep “throwing the ball” I’ll eventually throw another strike. So, I continue to paint. In art, I find my refuge. And no matter if I’m surging, or flat, I still love the experience of watching a world come into focus at the end of my brush or pencil. Now, I plan to read some more from the Willem de Kooning biography, and wait for sleep to overtake me. Tomorrow begins a new week at school. As I come to the close of a satisfying Easter holiday, I reflect on the festive atmosphere I was invited to share with some beautiful friends in north Arlington. Marvelous friendships were formed, thanks to a remarkable student I was privileged to have in my class back in 1989, my second year of teaching. How fulfilling to see her again, with her family, her parents, and a large circle of friends and colleagues. Before returning to school in the morning, I wanted to try and finish this 5 x 7″ sketch I started this morning in the Cave before attending the north Arlington Easter brunch. 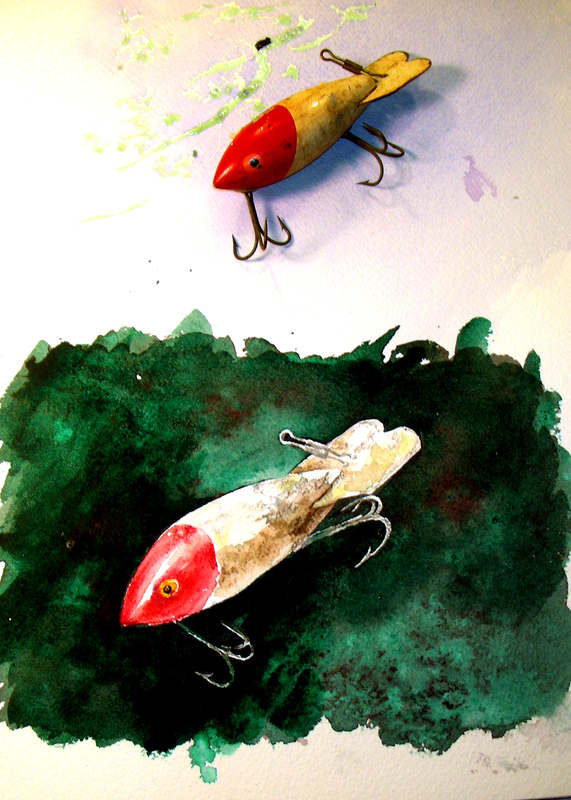 I like the watercolor effect of these vintage lures better on a dark background. Until now, I had always placed them on a white field. 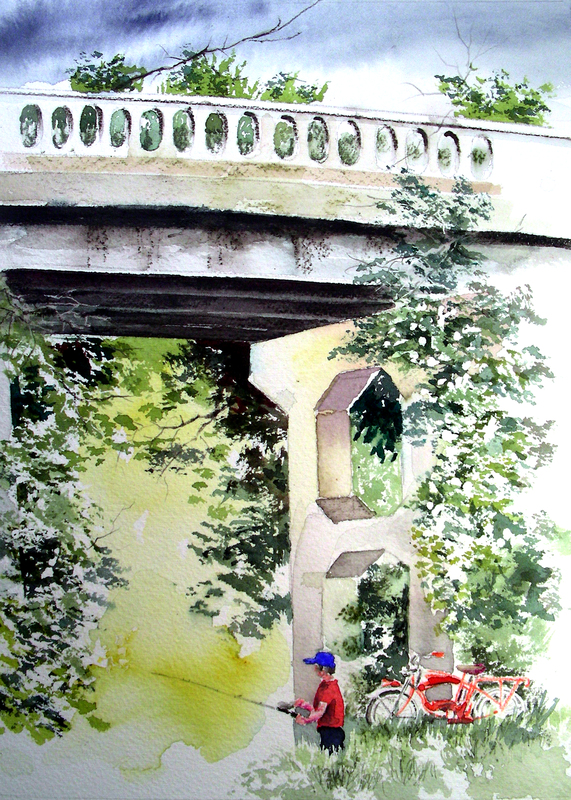 I think in the days ahead (before next weekend’s Art in the Park festival http://www.kennedaleartsfestival.com/) I may try a few more of these smaller watercolor compositions. “He painted far into the night with an air of great seriousness,” said Finkelstein. “He would go to the other side of his loft and stare fixated. Then suddenly he would come alive and then step back again. ‘Whoever he is, he must be one of the most serious artists,’ we said to each other.” According to Betsy Egan Duhrsen, “Bill just worked. He worked and worked.” No matter how late the discussions went at the Waldorf, no matter what tensions arose in his personal life, de Kooning continued to work with the relentless intensity of one who strives always to reach the unattainable. Mark Stevens and Annalyn Swan, de Kooning: An American Master. After a restless night when I couldn’t shut down my brain and go to sleep until nearly 3 a.m., I awoke without an alarm around 7:00, rose, made breakfast, and brought it out into the Cave to enjoy the cool morning. While eating, I watched a VHS tape documentary of Willem de Kooning from the “Strokes of Genius” series. I became so absorbed with it, that I pulled my biography (cited above) that I had read in its entirety back in 2004, and began re-reading the chapter that covered his emergence in the fall of 1948. One of the biographical notes that has stuck with me since my reading of this book concerns the drive of de Kooning that persisted for decades. In earlier blogs, I have poked fun at his tendencies to spend more time looking at his work than actual painting, and then his constant revision (actually, erasure!) of work he had spent several hours putting together. I rose from my reading chair, completely blank about what to do next, only that I needed to do something next. So, I pulled out the vintage tackle box lent to me by a dear friend, pulled out this old wooden Bomber plug, and decided to put it on a dark field of green, instead of the white that I had always used before and found unsatisfactory. Because of the layers of wet-on-wet, the painting is staying pretty soupy, disallowing me to do tight pencil work. So I continue to read from this biography of de Kooning. On this Easter morning, I post with amusement this illustration which has been my inspiration for over twenty years. The illustration, known as the Flammarion engraving, first appeared in Camille Flammarion’s 1888 book L’atmosphère: météorologie populaire (“The Atmosphere: Popular Meteorology”). I have always loved the look of the inquisitive pioneer, pushing past the veil, to the primal workings of the world. I have had this picture in my mind for over twenty years, every time I think of someone (or myself) trying to push into a new world, in discovering a new style, a new idea, a new pursuit. I post it today, honoring the memory of Willem de Kooning’s endeavors during those late New York nights in his Fourth Avenue studio, trying to figure out what to do next in painting. And I keep it before me today as I paint, trying to figure out what to pursue next. When in doubt, paint. And the young birds call out to be fed. 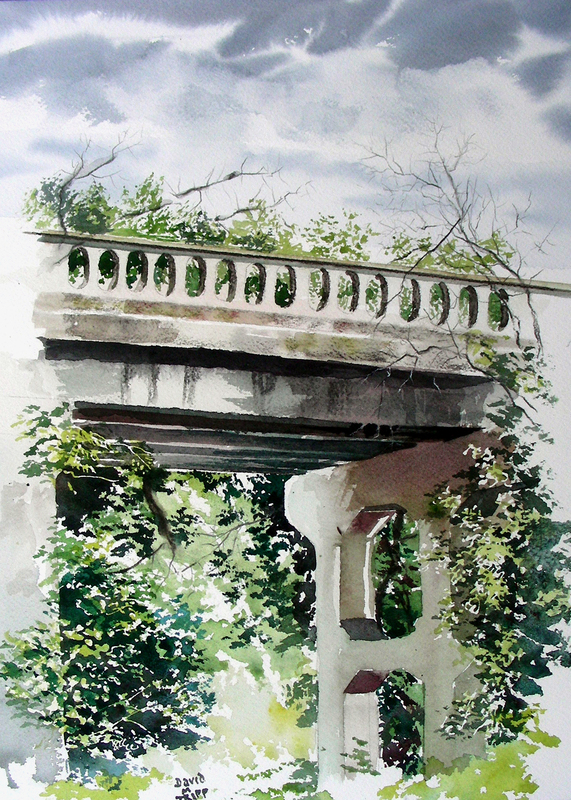 A couple of years ago, during the “Paint Historic Waxahachie” plein air event, I set up my easel beneath this 1930-era bridge as a storm gathered overhead. I was happy with the results, and rather surprised that I have been unable to sell this painting. Oh well. A few weeks ago, as I drove along the highway, listening to Neil Young on my CD player, this song played, and I captured the image of what I wanted to do next. I am usually disappointed in my efforts of painting from a painting, but nevertheless that is what I attempted in the Man Cave today. I used the old painting above to create the one below. I enjoyed the experience. Now I’m drained, and I suppose that after a good night’s sleep, I’ll decide tomorrow whether I like this one or not. It not, I’ll give it another try, because I certainly want to master this composition. When I posted it, I looked in vain for some of his work and photos I had of him, to no avail. 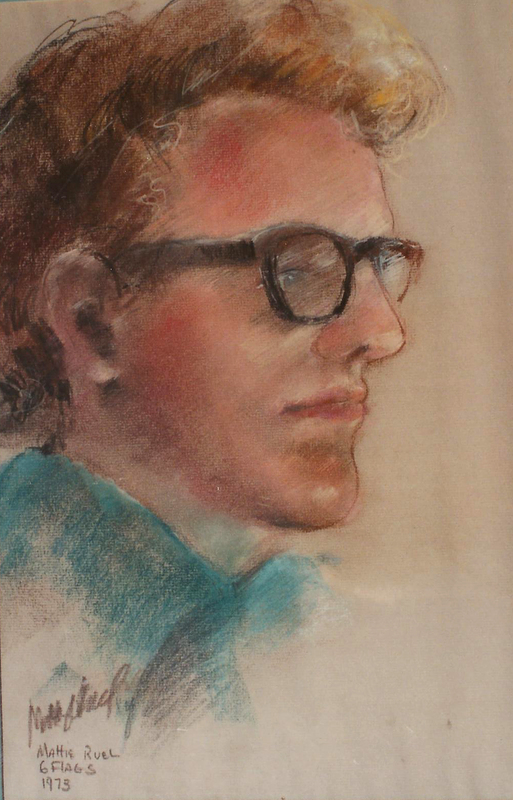 Well, last night I finally came across this photo taken of a charcoal drawing on newsprint paper that he created as a ninth-grade Art I student at Northwest High School in House Springs, Missouri. 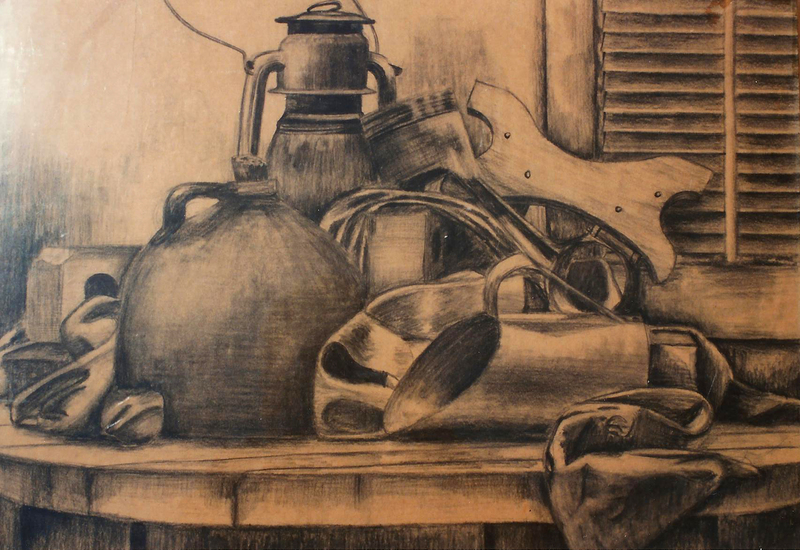 This drawing (measuring about 22 x 28″) won multiple awards and catapulted him to the top ranks of high school art students while only a freshman. He would only get better. 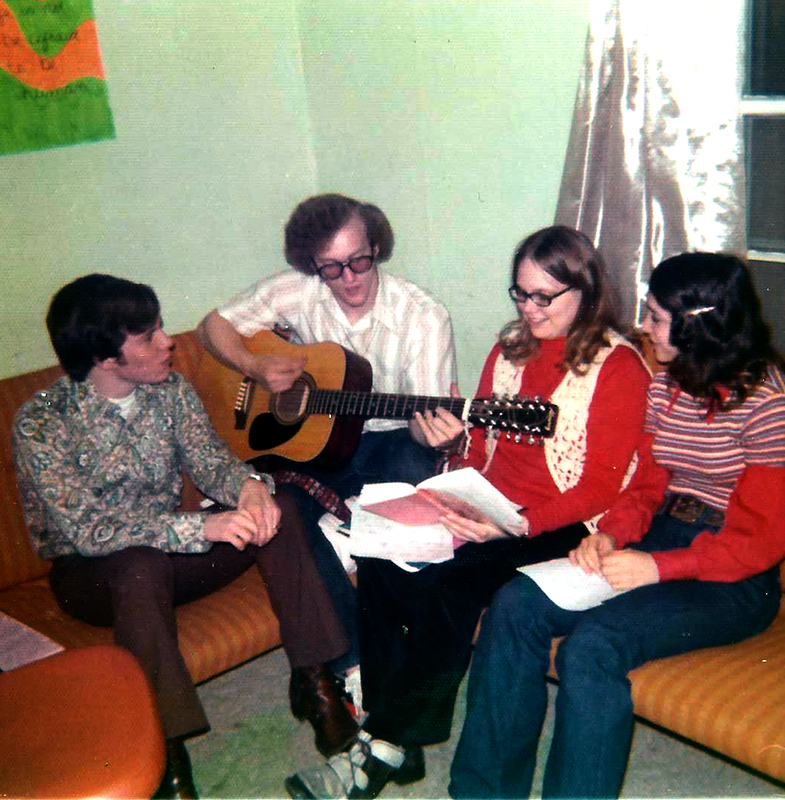 And finally, a photo I took (with a cheap Kodak camera) of Steve playing my 12-string guitar at a college gathering. It’s been nearly three months. I still miss him. What a wonderful morning to greet! I awoke before 8:00, without an alarm, showered, packed my plein air watercolor supplies, and drove to Cracker Barrel for breakfast. 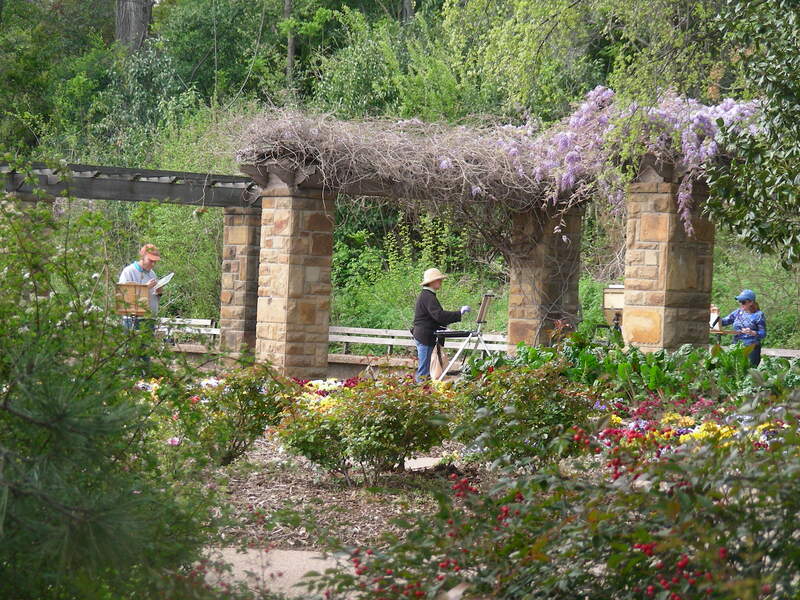 By 9:30, I was at the Fort Worth Botanical Garden, where at least sixteen other painters would gather today for the pure pleasure of painting in a 60-degree environment, with a gentle breeze, plenty of cloud cover, and sporadic bursts of sunlight. 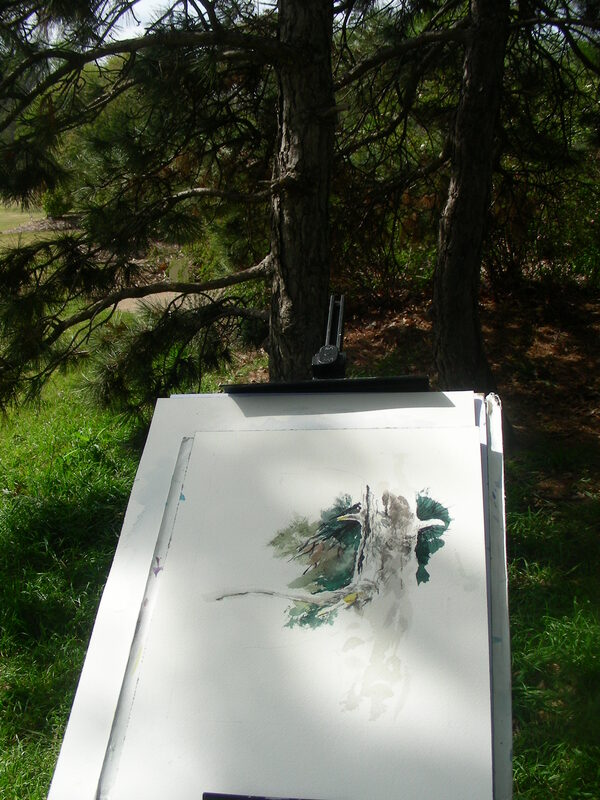 I’m out of plein air practice (first time in 2013). So I lingered over this one for ninety minutes. I did not allow myself to get in a hurry, or to think in terms of completing a painting worthy of framing. 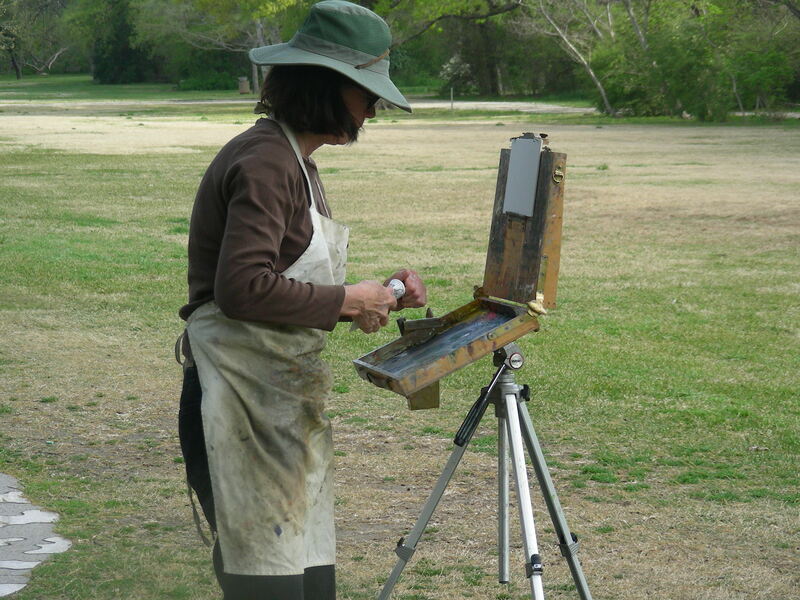 As one of my painter friends said this morning: “Plein air is not for finished paintings; it is Information Gathering, nothing else.” I kept that in mind. And like Willem de Kooning, I often spent more time staring and thinking than actually painting during those ninety minutes. I thought of Andrew Wyeth as I continually reached for the pencil and worked to manipulate the dry brush. The bark of this pine was so fascinating to my eye. I really want to turn around and try another one this weekend. I cannot overstate the sweetness and camaraderie I felt as I looked up from my easel to the right and saw these three, diligently at work on their compositions. Or turning around and watching her working so quickly and deftly on her oil composition. It was truly a magical day. A number of us finished the morning shift with lunch together at the Kimbell Art Museum, enjoying conversation and a rest from the session. Most of them returned for the afternoon. I, unfortunately, had some art business commitments to see through, so I loaded the Jeep and headed back to the studio for some matting and framing that had to be done. It is nightfall now, and my mind still goes back to the magic of this morning. Rene Descartes crawled into a stove late one winter night, to think things through. Ralph Waldo Emerson launched his two-year European odyssey following the tragic death of his young wife, hoping to figure out what to do next. 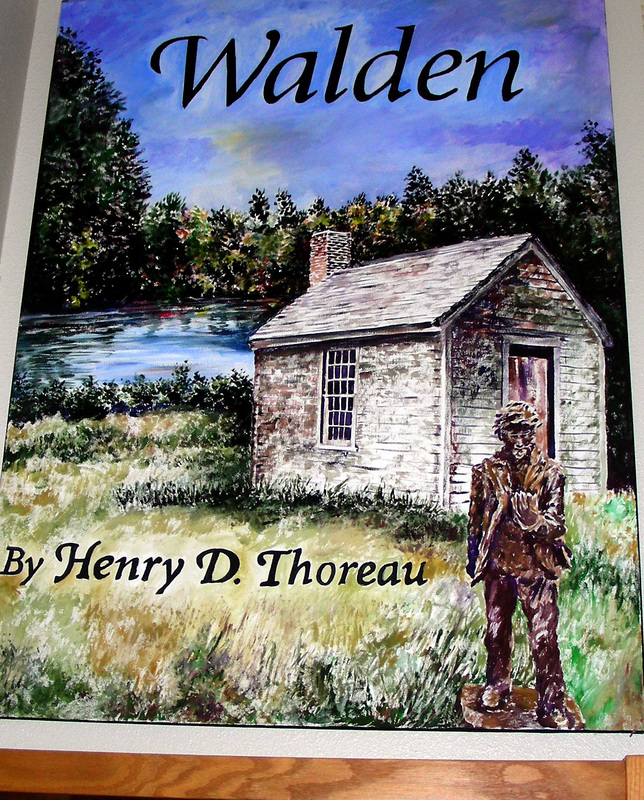 Henry David Thoreau retreated to Walden woods for two years, two months, two days, building a cabin and residing there to listen to nature, to learn directly from her, and figure out how to proceed with his life. We always refer to these retreats to the wilderness as times to retool, to rethink, to retread and figure out how next to move on. I just came off a disastrous art festival this past weekend–three days outdoors in the rage of arctic temperatures and gale winds (Texas weather the weekend before was in the 80’s and sunny). The horrendous weather managed to chase away all patrons, leaving artists and musicians hanging out to freeze in the cold winds. The event was finally canceled Sunday morning. We folded our tents, packed our creations, loaded out, and headed for our home shelters. In breaking down my tent, I sliced open my thumb on the right hand, making it impossible for a couple of days to hold a pen, a paintbrush, or even play a guitar. Gloom. Monday following the event saw me looking down the bore of a cannon called Progress Grade reporting. Deadline was midnight. So, after a day of teaching (following that disastrous arctic weekend of loading, unloading and injuring), I came home from school and inputted grades on the computer until 12:37 a.m. Then it was up again at 6:00 a.m. for another weary round of teaching. All of this to say, I haven’t blogged since Friday because I have been up to my eyebrows in trouble. I have been unable to paint due to the injury and the crushing deadlines and loss of sleep. But now, the wilderness has opened up and beckoned. I have been invited to accompany the art club from my high school on a field trip to the Dallas Museum of Art. And at the end of the day, an invitation awaits to attend the evening events at the Amon Carter Art Museum in Fort Worth. That, to me, is a gift from the Divine. A chance to retreat to the wilderness, to immerse myself in the finest art, and to reflect on where to go next with my own pursuits. A healing balm. Long overdue. 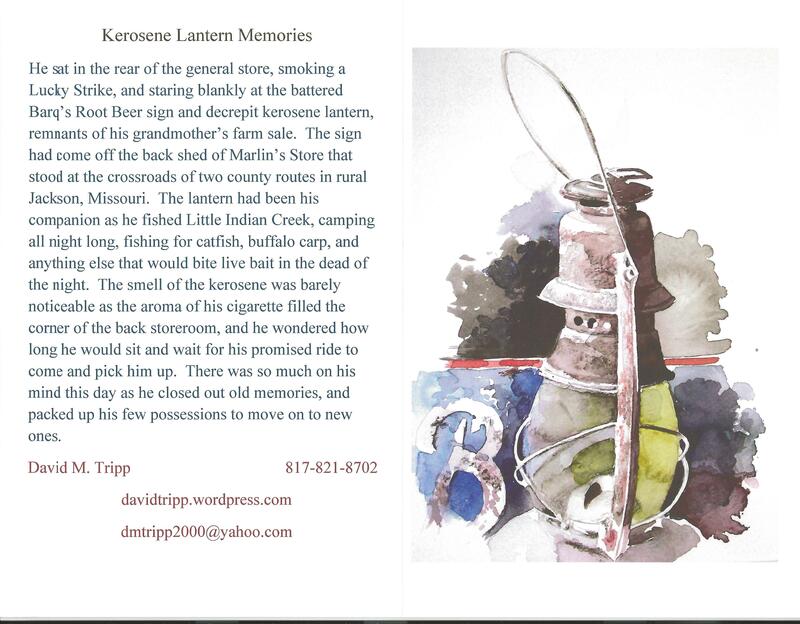 My earnest hope is that the next blog post will be soon, and will feature my next endeavor. I really want to push something else out, something new. But for tonight, I leave you with a 3 x 4′ acrylic canvas I painted for our Martin High School library, featuring Thoreau and his treasured book Walden. Tomorrow, before leaving for the museum odyssey, I am thrilled to sit with my Philosophy class and discuss the text of Walden and to apply this spiritual principle of retreat and renewal, found in the solitary wilderness. B-r-r-r-r-r-r!!! Temperatures Friday afternoon have already dropped to 48 degrees, and the arctic wind is cutting us to pieces! I pulled off my gloves long enough to take this picture, and type a few words. Texas had been enjoying temperatures in the 80’s only a few days ago. Too bad an outdoor festival had to draw this kind of weather lottery–seems a cruel practical joke. I’m enjoying my Hemingway biography, and hoping some crowds will pick up eventually. Frankly, I cannot blame anyone for choosing to stay indoors today rather than stroll the park. But the artwork out here is magnificent–80 artists represented this time. More later. Got to pull my gloves back on! After school today, I will leave for Richard Greene Linear Park, between Cowboys Stadium and Ranger Stadium. I set up my tent yesterday afternoon in gale-like winds. I thought we were going to blow away. I hope I won’t arrive today to find my tent has sailed down the creek that runs behind it. This will be a three-day event, and I hope to do some blogging onsite. 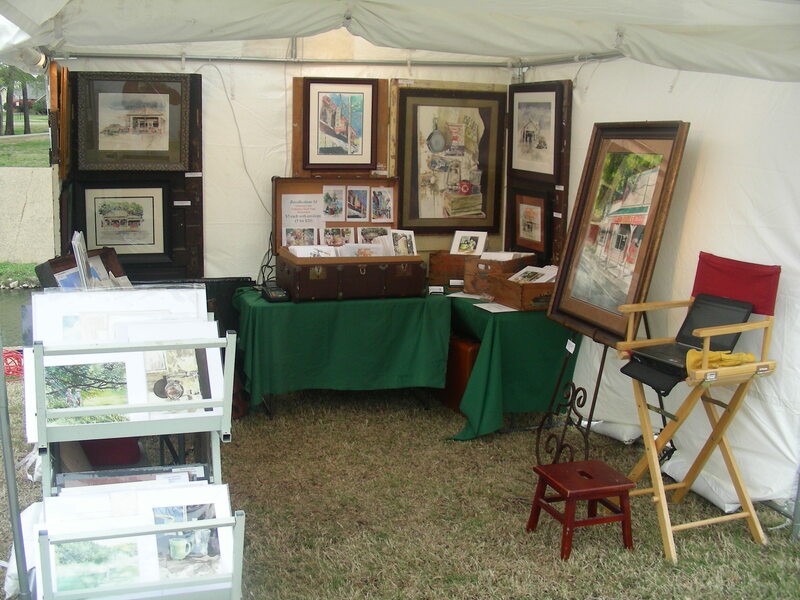 I have posted an image of my booth from last year’s festival. I am confident that I will have a better presentation this year, as I spent a good portion of Spring Break last week plotting out a different look. It has turned into quite a job, composing narratives for all these new cards (the second one had already been composed and posted to the blog weeks ago). I love to write, but it doesn’t come that easily for me. And of course, I’m never sure if my fiction images really connect to others who read. Nevertheless I enjoy it.